Working in facilities from hospitals to long-term care, licensed practical nurses are an in-demand career choice in Mississippi. Partially due to an aging baby boomer population, the need for LPNs will continue to grow; between 2014 and 2024, the Bureau of Labor Statistics expects to see this number increase 16 percent across the nation, equating to 117,300 new LPN jobs. Across Mississippi, both community colleges and vocational schools have added new programs to meet this growing need. 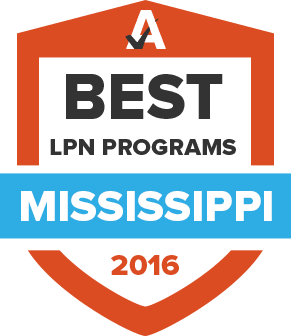 Learn about the LPN career, find resources to help you along your career path, and search for the top programs in Mississippi. From the Gulfport area to the Tennessee state line, community colleges and vocational institutions offering LPN programs exist across Mississippi. When choosing a program, finding info on a prospective school’s accreditation, acceptance rate and test scores can help with the final decision making process. Use the below search tool to discover programs based on criteria like school size or cost, and choose schools to see in a side-by-side comparison. Although Mississippi is less stringent than other states when it comes to mandates and rules about LPN licensure, the state still has a number of steps that must be completed before a candidate can receive their license and begin work. Unlike other areas, the Mississippi Board of Nursing does not approve practical nursing programs within the state. This job is left up to the Mississippi Board for Community Colleges, meaning students should consult their list of approved educational institutions before committing to a program. After completing a program endorsed by the MBCC, graduates must submit a license by examination application and a $60 fee to the board and have their official transcripts sent directly by the school. The next step is to register for the National Council Licensure Examination (NCLEX) via the closest Pearson Vue testing center and wait for an Authorization to Test notification. If the candidate successfully passes the NCLEX, they can expect to receive their online license verification within five to seven business days. If an LPN lets their license lapse, they will need to fill out an application and pay a $100 reinstatement fee. Mississippi does not currently mandate continuing education credits be completed during each two-year renewal period. In order to receive a renewed license, current LPNs must fill out an application either online or on paper and pay a $50 renewal fee. Whether just starting out or well into their careers, LPNs can expect to see their salaries rise as their experience in the field grows. The following tables outline different wage categories and highlight the best areas of the state for higher salary potential. While the state as a whole is expected to see an 18.6 percent increase in new LPN roles, some cities may experience higher or lower rates of growth. The following tables are designed to help candidates who are willing to relocate find the best cities for employment as an LPN. Covering topics ranging from practice and licensing to the basics of being an LPN, the Board’s helpful FAQ section can answer many of the common questions prospective or current LPNs have about the occupation. As the regulatory body for schools of practical nursing within the state of Mississippi, the MCCB works closely with the Board of Nursing to identify programs that meet the standards set forth for graduates to be eligible for licensing. The MHA operates as the voice for those working in health care professions, providing advocacy, education, relevant news and resources to enrich their work. The site also maintains a listing of available jobs at Mississippi hospitals. The nursing education arm of MIHL offers a variety of scholarships and information about various nursing careers for prospective students. This helpful database of information about occupations and industries in the state of Mississippi has valuable insights about LPNs throughout the state. Since 1970, MLPNA has been the voice of thousands of LPNs working in Mississippi. The organization offers resources for students, continuing education courses and an annual convention. MNA offers its members a variety of benefits and helpful services, including information on relevant legislation and news affecting the profession. The association also hosts regular events and meetings. The Mississippi chapter of the NFLPN hosts events that are open to fully licensed practical nurses working in Mississippi. The national chapter also provides a bevy of helpful resources. As mandated by the Mississippi Board for Community Colleges, these 27 community colleges and vocational schools offering practical nursing programs have been approved for granting certificates.